Price shown is for a rack consisting of 4 modules of support. Price will adjust and show at checkout should a different quantity of modules be required. The price per module is £129.99. The all new, 5 star What Hifi? Sound & Vision Magazine award winning (January 2018) British made solid Oak Apollo Storm 6 modular hifi support makes a stunning centrepiece for displaying, supporting and isolating hifi equipment in the home. The Apollo Storm 6 is not just an attractive piece of furniture; it has primarily been designed to maximize the performance of hifi equipment supported upon it. With a choice of two leg colours, four storage heights and manufactured out of warp resistant 27mm solid hardwood composite wood for strength and resonance absorption, each of the individual modules legs feature three additional levels of isolation. First a polymer isolation disc separates the outer leg collar from the wood forming a barrier between each of the wood and outer leg components. The second line of isolation is the leg spike cap. This too is a polymer construction, so the leg outer collar is completely isolated from residual sonic feedback present when playing music. Inside each of the leg spike caps a press fit brass screw thread has been inserted. (brass being chosen for its slow energy proliferation speed) with the third and final level of isolation has been achieved with the use of fully adjustable 8mm Bright Zinc Plated steel spikes and matching lock nuts. Please Note:- Oak is a natural material, so block colour variation, knots and grain texture is part of the intrinsic beauty of this hifi support. Every module is aesthetically unique and will darken over time as part of the woods ageing process, especially if exposed to sunlight. 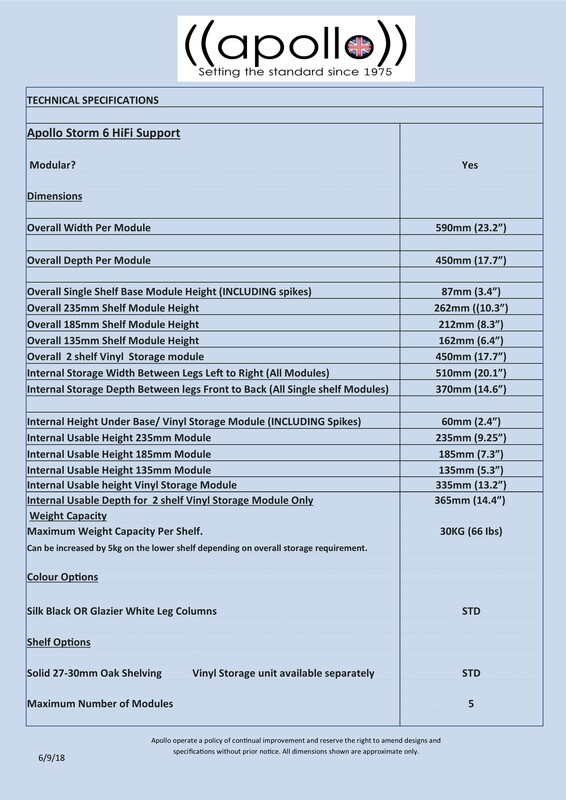 This difference will be enhanced should you add new extra shelving at a later date, so where possible purchase your Apollo Storm as a complete matched set taking into account your future storage requirements.